This weekend was a great deal of fun, but hardly what I’d call relaxing. After sending the girls to school Friday morning, I drove up to the cottage my parents are renting for the summer to help bring up a season’s worth of gear. I was back in time to greet the kids after school, at which point I starting packing up everything I’d need for Russell Flea on Saturday. Saturday I was up bright and early to vend at Russell Flea; after packing up my stall at close of business, I drove directly from there to a friend’s fantastic house party that doubles as a fundraiser for CHEO. At the same time, the kids participated in a community parade in the morning, then went out with their grandparents, then Thing 1 went to a birthday party. Meanwhile, after getting the kids to the grandparents, my husband went off to a Magic: The Gathering tournament with his brother. And then I collapsed on the couch for a few hours. All that to say that it has been a pleasant weekend, but I am exhausted. 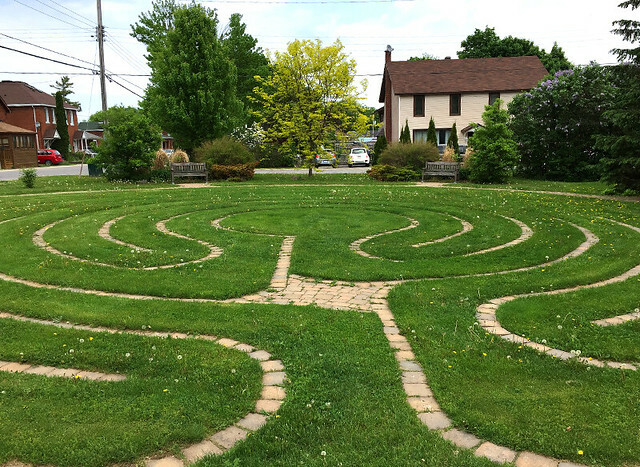 I rather wish that we had a labyrinth like the one in Carleton Place, which I happened upon a couple of weeks ago when in town for yet another pick up. When I saw the sign, I was kind of hoping for a hedge maze, but this was pretty darned cool. 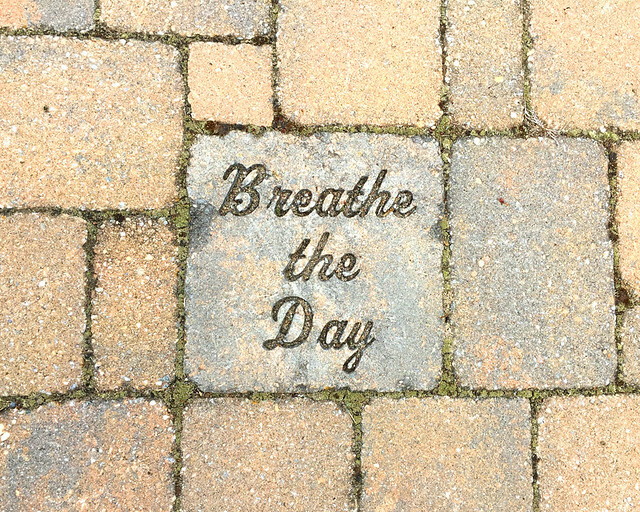 It’s meant to be a meditative, spiraling walk to the center of the stone pathway, and then back out again. I’m not generally much of one for meditation, but after a weekend like this one I think that walking a labyrinth like this would help me clear my head. A good night’s sleep probably wouldn’t hurt, either. And I have to remember to breathe. Posted on June 4, 2018 June 3, 2018 by owntwohandsblogPosted in Exploring, flea market, GardeningTagged garden, Gardening, meditation, path, pattern, spiral, summer, weekend.